Alexandra Hart is known for her sophisticated and artful couture jewelry and metal sculpture. With both Bachelors and Masters degrees in art and metalsmithing, with fashion experience designing for Lagerfeld and Givenchy jewelry, and with fine jewelry design and manufacturing with Barbara Heinrich Studio, she has achieved the synergy among artistic inspiration, high design and skillful craftsmanship that many artists spend their entire careers chasing. Launching her business in 1995, Alexandra Hart began marketing her socially responsible company to retailers through premier American Craft tradeshows such as The ACC Baltimore Show and The Buyers Market of American Craft, Philadelphia. She established herself as a creative jewelry artist with leading craft and art galleries across the US. Having won the 2009 Centurion Emerging Designer Award, having been selected by the World Gold Council’s 2009 campaign, and exhibiting at AGTA’s Spectrum of Design Pavilion in Tucson AZ, and NICHE, The Show in Las Vegas, she has shifted her marketing plan to focus more on fine jewelry retailers, bringing her dramatic aesthetic vision to the competitive luxury market with the highest standards of quality and business ethics. Invited to exhibit nationally in both galleries and museums including California Center for the Arts Escondido Museum, Mingei International Museum, Oceanside Museum of Art and The Athenaeum, LaJolla, she has received several awards, such as above mentioned Centurion Emerging Designer Award, the Draper Award for Outstanding One Person Exhibition at the Delaware Center for Contemporary Art, and finalist in the American Couture Jewelry Awards and Niche Awards. 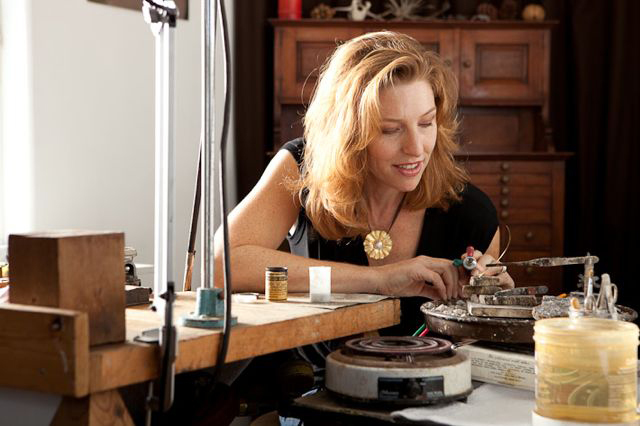 Her work has received national and international consumer and trade press coverage, from Metalsmith, Lapidary Journal, JCK, Modern Jeweler, Brides Magazine and Ornament (all USA), to Jewelry World Review (Thai), Fashion Quarterly (CAN), Australian Vogue and KAREN Magazine (AUS).